Revamp your look and get lustrous locks without damaging your hair with the Vega Long hair curler. The curling iron has cermic coated plates and provides bouncy, shiny and frizz free curl without hassle. The long barrel of 210mm length is ideal for faster styling results as you can wrap longer strands of your hair in one set around 22mm diameter barrel. This also has a clamp to hold the hair and create natural curls without kniks. It has LCD display and you can easily adjust temperature 80°C to 230°C as per your styling need. This product is available in Snapdeal, Flipkart, Tatacliq. At snapdeal.com you can purchase Long Curl ( VHCH-04 ) for only Rs. 1,105, which is 44% less than the cost in Tatacliq (Rs. 1,976). The lowest price of Vega Classic Flat VHSH-04 Hair Straightener Black was obtained on April 16, 2019 6:57 pm. 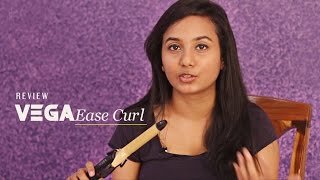 totally in love with this curler…it works like magic with less damaging ur hairs as compared to other culers. in addition amazon did an amazing job in its packaging. Have used it once so far. my hair is thick. Curled very well even at low heat setting. Hope it will last long. Bought this hair toaster for my sister as a womans day gift, She seems happy so I guess the product is good and working as intended. It’s really awesome …I lllllloooooooooovvvvvvveeeeee it … very nice curls . Thank you soo much AMAZON.